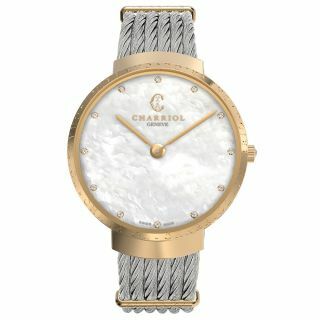 34 mm steel case, white mother of pearl dial, steel cable bracelet, Swiss movement. 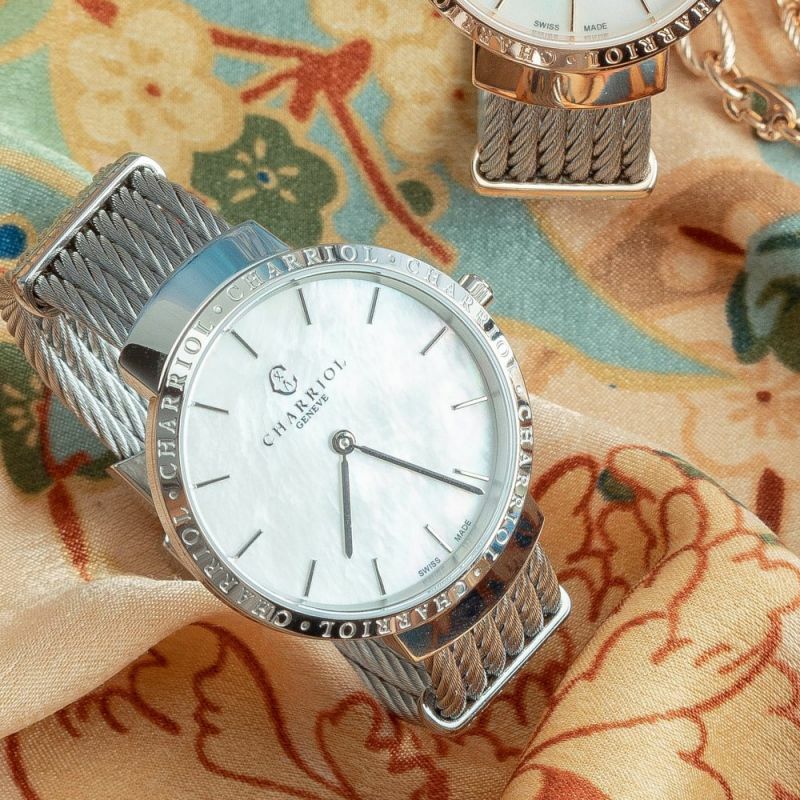 Ideal for everyday wear, SLIM is a modern timepiece with a young and rebellious spirit. Its slim bezel is both on-trend and elegant. We ship via FedEx (International Priority) to most international locations. Below 238 CHF (Swiss francs) cart including taxes (around 250 U$D), the shipping price is 18 CHF (around 19 U$D). Above 238 CHF (around 250 U$D), shipping is free. Our average delivery time is less than 7 days. Returns can be made within 15 days from delivery date, for a product in perfect condition, accompanied with full packaging, notices, guarantee card and sales receipt. Returns are under your responsibility. 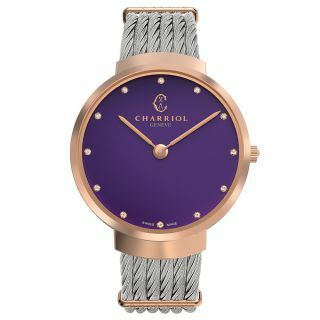 They must be sent at your sole risk and expense by pre-paid registered mail or courier and duly insured to Philippe Charriol International Ltd, 12, rue le Corbusier, 1208 Geneva, Switzerland. 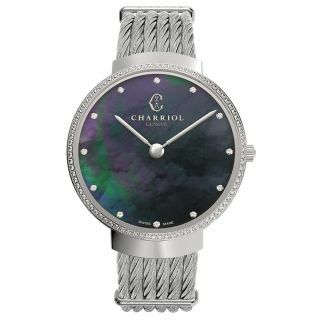 Merchandise cannot be returned to any CHARRIOL boutique worldwide, to any Charriol retailer, nor can any merchandise purchased in a CHARRIOL Boutique be returned to Geneva. In case the parcel is lost, you are responsible to prove that you returned the product. Quality of the products will be checked upon receipt. 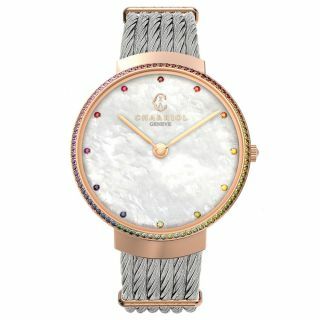 They will not be accepted if they have been worn or if they present damages or alterations. In such case we may send you back the product. The appreciation of the condition of the product returned is at our sole discretion. Returned products, if accepted, can be exchanged or refunded. If returned, you will be credited of the value of the products returned. 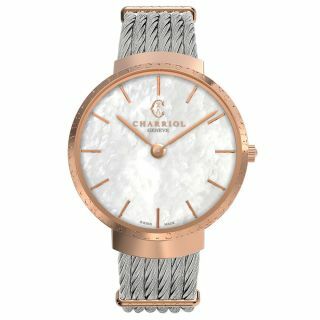 If exchanged, you will be credited of the value of the products returned and you will have to buy online the product wanted. Refund will be made by bank transfer. Shipping costs will not be subject to refund unless there has been a shipping error from us. 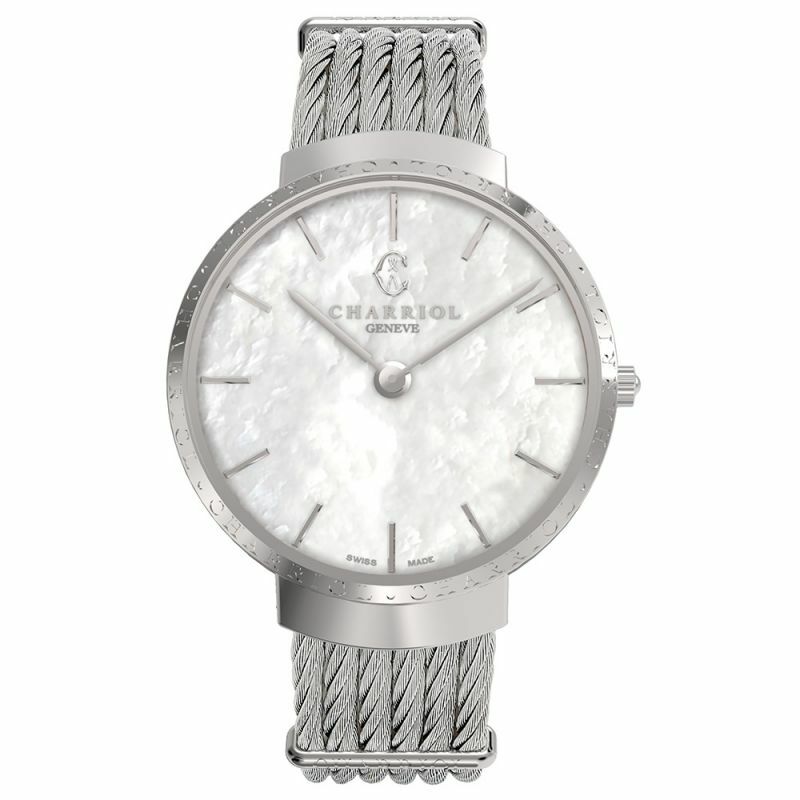 34 mm steel case, white mother of pearl dial, steel cable bracelet, Swiss movement. 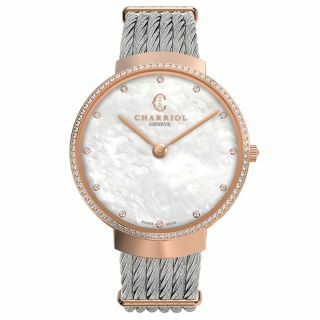 A very fine bezel gives the SLIM watch a clean, modern look that is both on-trend and highly elegant. Full of youthful energy and infused with a spirit of rebellion, it adds edge to any daytime or evening look. 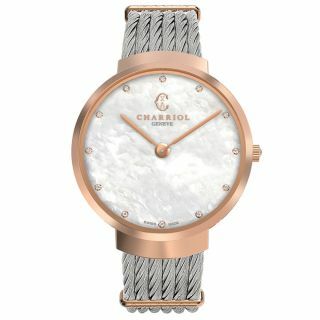 Kept deliberately minimalistic, the dial reveals a shimmering expanse of white mother of pearl, interrupted only by the Charriol logo at 12 oclock. 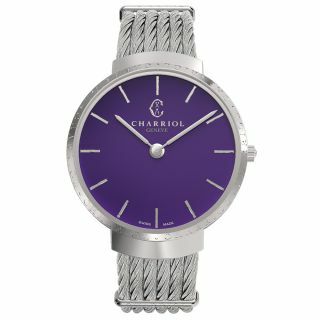 This covetable Swiss Made design in steel is finished with Charriol lettering on the bezel and an open-ended twisted cable bangle. Easily combined with any outfit. 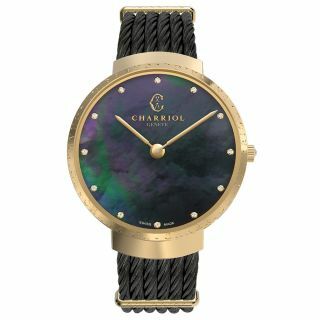 French creative design coupled with Swiss precision and backed up by stringent quality control at every stage of its manufacture, make this timepiece a truly exceptional product. Each genuine CHARRIOL watch has its serial and product model numbers engraved on the back of the case. 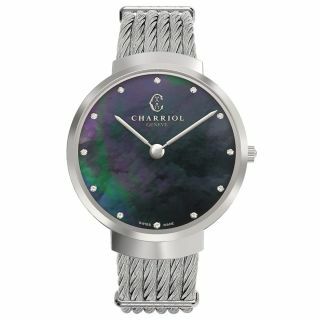 Your CHARRIOL watch is guaranteed under normal usage against all defects in workmanship and materials for a period of 2 years from the date of purchase. If you continue to browse this website, you accept third-party cookies used to offer you videos, social sharing buttons, contents from social platforms.